Why do some apps open so much more slowly than others? The answer could lie in the storage embedded in your phone. 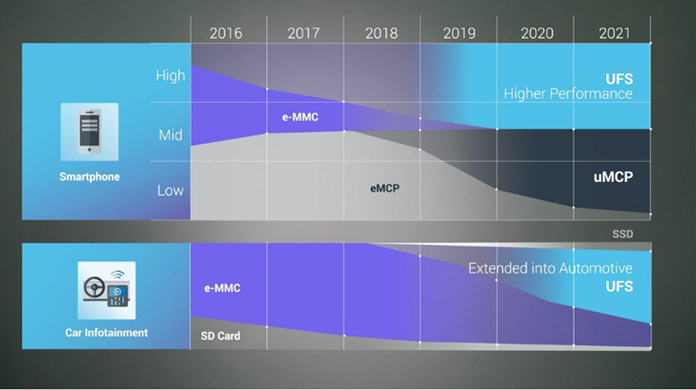 Created as the higher-performance replacement for e-MMC, Universal Flash Storage (UFS) has become the go-to memory solution for high-end smartphones, and is finding its way into mid-tier phones as well. UFS is also being used in sophisticated new automotive applications such as entertainment & information systems and advanced driver-assisted systems (ADAS), due to the increasing amounts of storage they require. For applications requiring high-speed read/write performance and low power consumption –in addition to smartphones, tablets and automotive, these include augmented and virtual reality systems and the like – UFS shines. We were the first to introduce UFS – and are spearheading the evolution of the technology.